Tiki Wiki is one of the most feature rich content management systems available today. With just their initial installation they offer a wide range of different options that simply aren’t available on any other platforms without using plugins. Users of this CMS love the fact that they don’t have to go out and install plugins to get the features they need, but other people find that having so many options by default can be confusing and even cause performance issues at times. The different features can be disabled when they aren’t needed, which does give some additional control for the admins of the site. You can use this system for making just about any type of site you would like, which is another thing that many people like about Tiki Wiki. Using the one-click installation script that is included with all of our hosting packages you can get this platform up and running quite quickly. Getting the site configured the way you want it for your first time users, however, can take a little extra time. There are so many features available that it can get overwhelming. When going through each one you will need to decide whether to have it enabled or disabled, and also configure many of these options the way you want them. While this will certainly take more time than most other CMS’s out there, the end results can often be worth it. There is little need for third party plugins when you use Tiki Wiki because most of the functionality people use plugins for is included in the default installation. There are, however, options for plugins and they are easy to install. The total number of plugins out there is fairly low, but that is more because of the fact that they aren’t needed than anything. Most of the themes available for this platform are made by third party programmers. While not as many as a CMS like WordPress, there are enough for most people to be able to find a good theme that they will like. Of all the content management systems out there, this one is one of the most customizable. Since there are so many built in features, each of which you can configure to operate as you want it, it seems like virtually everything can be customized. If you’re looking for a platform that you’ll have full control of, this is an excellent option to consider. Tiki can be quite powerful for SEO right out of the box, as long as you set up and configure the right settings properly. It can allow you to do all the SEO best practices automatically as well as make a number of different manual configurations based on your own personal strategies. You will want to take some time to go through all the different settings in order to get the best possible performance for SEO, but if done right it will be well worth the effort. This CMS is free to download and run for any type of site. One thing you want to be aware of is the system requirements for running some of the different features. If you have the majority of the options enabled, you will most likely want to host your site on a VPS or even dedicated server if you’re getting a decent amount of traffic. These types of hosting are more expensive than shared hosting, of course. If you’re only using a few of the different options, then shared hosting is more than enough. Overall this is one of the most powerful and flexible CMS’s out there today. You can use it to create almost any type of site you can imagine, and it is well maintained and updated by the developers. The down side, however, is that it can be overwhelming since there are so many options that you need to be aware of. If you don’t have experience with managing websites already, this may not be the best place to start. 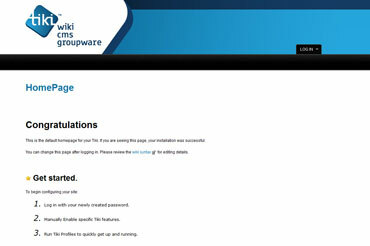 We keep up to 30 daily backup copies of your Tiki Wiki CMS Groupware 9 site.